# At first we’ll prepare the dough. Pour warm water into a mixing bowl, add salt and mix it. Add flour little by little into this salty water and knead this mixture constantly. Make the dough nearly hard. # Cover the dough and rest it for half an hour. # Meanwhile, prepare the stuffing mixture. Cut the parsley and onion into too small pieces. Grate the tomatoes. Transfer these ingredients into a mixing bowl. Add minced lamb meat, sunflower oil, salt, black pepper and mix it. # Divide the rested dough into 12 equal pieces. Roll out each of the dough pieces over floured bench by a rolling pin until make them a bit smaller than dessert plate size. 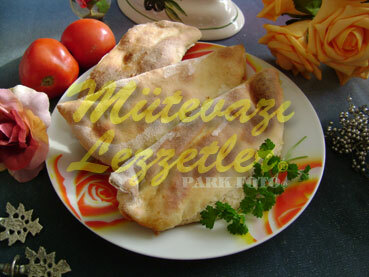 # Put meat mixture onto one half of the rolled out dough and cover it by the other one. Cut the edges by a plate. # Each piece is called as sembusek. Place the sembuseks into the greased baking tray. Mix 1 tbsp flour with 3 tbsp water and spread this mixture all over the sembuseks to make them seem brilliant. # Place the tray into the oven which is preheated to 392 F. Cook them, until they turn into pink. Note: Sembusek is a delicious borek that is belong to Mardin and its taste is similar to lahmacun.